…a Writer, is a Writer—as a rose is a rose is a rose. Within the genus Rosa (in the family rosacea), there are over 100 species and thousands upon thousands of exquisite hybrid cultivations, many of which are being created even as I write this blog. That is how I see a writer—a person who has the vision to create a specific piece of writing, whether it is a blog, a novel, textbook, mechanics manual, tweet, or the most inspired and uplifting play and/or film script ever written. Where do you fit? When there is a concept flapping around in my thoughts and I can’t seem to get it OUT on the page, I take a walk. Sometimes it’s a short walk down the hallway of our apartment building and across the scenic connection bridge to the café for their brand of coffee and back again. Often I grab my sun hat and walking poles to enjoy the canal path just a block away. Once in a great while I’ll drive up into the foothills and step into the illusion of being alone in the wilderness where seasonal wildflowers greet me and evidence of coyote, deer, or bear might be found on the trail. And, all the while, those ideas for that writing project are sorting themselves out and settling into place. That’s the working theory anyway, and I can happily report that most of the time it is successful—for me. Last month I took one of those walk-in-the-wilderness excursions; four days of placing myself in a lodge away from my normal routine and setting myself up to focus on one particular project. Sometimes we just must shake ourselves from normal patterns—like turning the soil around rosebushes and adding fertilizer—to allow the best writing that is within us to COME OUT! That time away was (as the cliché states) a little slice of Heaven. I’m attaching one (of over 160) photos I took during that time, just to give you an idea about that environment of inspiration. 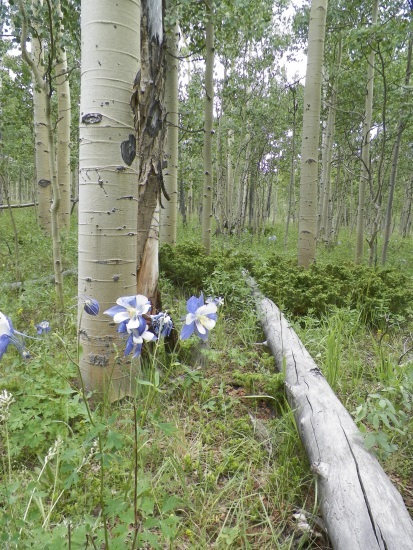 Notice the rough marks on the standing aspen trees? Deer or moose marked his passage there. Then an hour later I was talking with the manager of the lodge and discovered that she’d “always wanted to write.” Friends have been telling her for years that she is a “born writer.” So, why is she managing a mountain lodge? We talked about seasons-of-life and what they teach us in preparation for being the writer we’re meant to be. Just think of the people (sharing their life-events with her) who have stayed in her lodge. Imagine the mountain stories she’s collected from the town folks, delivery drivers, and back-country hikers. Oh, she’s in a great season-of-life to delve into writing—and publishing. I’ll be watching for her books! Next Next post: How Much Do Self-Publishing Authors Earn?